Editor’s note: This interview was originally published in Eastern Horizon, who have very kindly given consent for it to be republished here. 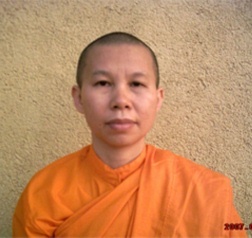 Dhammananda Bhikkhuni (Su co Nguyen Huong) from Vietnam recently completed her Ph.D. in Buddhist studies from Kelaniya University, Sri Lanka at the age of thirty-eight. She stopped over in Kuala Lumpur for a few days in January 2009 on route to the Santi Forest Monastery in Sydney at the invitation of Ajahn Sujato. Barbara Yen from Buddhist Gem Fellowship was given the opportunity to interview her for Eastern Horizon, 2009. Venerable, you mentioned that you earned the nick-name ‘1001 Questions’ nun when you were doing your studies in Sri Lanka. How did it come about? You said that you grew up in Ha Tinh Province, north Vietnam and you were not exposed to Buddhism. How did you come into contact with Buddhism then? As a child, my father who had lived in Thailand, would tell us stories about the monks there. However, I was exposed more to Christianity as there was almost a church in every village, but there were no temples. At age thirteen, I attended church services for three to four years and decided to become a Christian nun. My family especially my second brother strongly opposed to this and I dropped the idea. He knew that I was an introspective person and he encouraged me to learn classical guitar, singing and literature. At that time I was composing music for string instruments. When I was nineteen, I read the works of a famous Buddhist poet Truyen Kiew who was born in my hometown. My grandmother and aunt used to sing to us his songs when we were little. His book ‘The story of Kiew’ about a nun, had a lasting effect on me. Venerable, at what age did you become a bhikkhuni and what motivated you to take this path? I was sixth in my family of ten children. At age thirteen, I saw my grandmother, mother and sister trapped in a domestic life, producing children and I decided “this is not for me.” I felt I was missing something and I needed to search for an answer. There was war and evil in society and I felt the only way to be virtuous was to be a monastic. When I was sixteen, I had a vivid dream that I was a Buddhist monk going on alms round and my parents were devotees! I was so determined to be a nun that when I was twenty-one, I went to live in Can Linh Monastery in Vinh City. The abbess Venerable Ni su Thich Nu Dieu Niem, became a great mentor for me. She exposed me to the sutras especially the Heart, Diamond and Surangama Sutras. Although she was in her seventies, there was no generation gap. We worked together to serve the poor and we laughed a lot. However, my second brother opposed to my being a nun and forced me to leave and I lived with him in the city. He later married and had a daughter. When daughter was two days old, my brother was killed in a car accident. I had to give support to my sister-in-law but after three years of ‘being strong for her’, I had to get out of my depressed state. In 1994, I returned to the nunnery again. I wanted to pray for him to get a good rebirth. The abyss welcomed me back with open arms. About a year later, my mother learnt that I had become a nun and came to take me home! However, I made her stay for a few days at the temple and she later changed her mind as she could see how happy I was. She was under the impression that I was working in the city but wondered why I never came home, even for the New Year! When I was twenty-seven years old, my mentor passed away and I became the abbess! It had about a thousand devotees and running the temple was not easy as I was young and inexperienced. I later left to further my studies in Myanmar and Sri Lanka where I received my higher Ordination 2004 in Upasampada in Anuradhapura, Sri Lanka. You started off as a Mahayana nun. What made you change to the Theravada tradition? In 1995, I began reading Ajahn Chah and Ven. U Pandita and became interested in Vipassana meditation. A year later I heard of a well known meditation master, Ven. Vien Minh Mahathera and travelled two thousand kilometers to learn from him and from Ven. Dhammarakkhita Mahathera at Buu Long Monastery, Long Binh, Ho Chi Minh city. They also taught me basic Buddhist doctrines and Pali. One of my brothers who became a monk and my Master saw the potential in me and encouraged me to further my studies in Buddhism in Myanmar. The latter helped me secure a Myanmar government scholarship to do a diploma course in Buddhism in 1998 and later a Bachelors degree. While in Myanmar, I took the opportunity to deepen my meditation training and spent a year in various meditation centres including Swe O Min Dhammasukha Centre. However, I was not satisfied with my level of practice and I felt there was a barrier which I could not break. I called my Master in Vietnam. He then encouraged me to do the MA course in Buddhist Studies. He enrolled me at the Postgraduate Institute of Pali and Buddhist Studies (PGIPBS), University of Kelaniya, Sri Lanka. In 2004, I completed the two year course in one year with good results. In 2005, my Master then encouraged me to do my Ph.D. For the first year Professor Asanga helped me get a scholarship from Ceylon University Women’s Association. Many a time when the course was tough and I wanted to quit, Prof. Asanga spurred me on. A Danish friend who is yoga teacher gave me the financial support to complete my studies. Venerable Kusuma at whose centre I had lived, was also a great source of inspiration for me. In many countries, Bhikkhunis often have to overcome many obstacles in order to go forth. Do you want to share your experience in this? I was fortunate to have not experienced major obstacles or discrimination. In fact I had encouragement all the way except in my early days. My Master in Vietnam always gave nuns more allowance than monks. When they complained, he explained that women have more needs than men. What are some of the projects that you had embarked upon your return to Vietnam in 2008? For a start, upon my return to VIỆT NAM after my studies in Sri Lanka, we distributed gifts to the poor as it is the Vietnamese New year. This is in Son Kim Commune, Huong Son District, Hatinh Province, a community border to Laos where people are poor. Many of them belong to minority groups and have no formal education. Many are disabled children from poor family. This is the village where I was born and sadly, it is the poorest region in Vietnam. I had a lot of difficult times there. I also went to Hue City, central VN to help some monks lead by Ven Phao Tong and Ven Tue Tam in their relief-work after a severe flood which occurred very near my birth place. We distributed food and other items and were able to share some Dhamma with them. Vietnam has a 3000 km coastal land and every year, middle parts of the country are hit by storms and floods. Towards the end of 2007, five storms accompanied by floods had swept over Vietnam, from Thanh Hoa to Binh Thuan. People in these area are very poor, more then 85 percent are farmers. Excessive rain and floods have destroyed most of their crops. Many thousands of farmers and fishermen were left with no shelter and essential materials for survival. Together with lay supporters we organised many charity trips to support them. Still there are many survivors who do not receive aid from the government or non-governmental organizations. My vision is to build centres for Buddhist studies and practice in some provinces where Buddhism was destroyed during long years of wars and under communist rule. There are many thousands of Buddhists in these provinces, but they are very poor and most of them do not receive formal education. There is a lot to do to uplift their quality of life and to help them understand more about the Buddhist faith and practice. Presently, I am finalising the procedure to build a Buddhist meditation, educational and cultural centre in my birth place. It will function as a library, a Lumbini garden for children to play, a meditation and multi purpose hall and a guest house where practitioners as well as visitors and students from afar can stay. At the moment, I help raise funds for children who are poor or disabled to help them have a chance to receive education. I hope to develop a new vision in Buddhism for the young. When I returned from my studies after ten years, my friends lost no time in arranging for me to give Dhamma talks round the country. I was very surprised that I could convert people, many of whom were academicians and even army officers. I would like to have some of my Dhamma writings and articles published in Buddhist journals to be translated into Vietnamese and published for free-distribution to the poor Buddhists. I have completed a Pali-Vietnamese Dictionary with the help of my Dhamma sister Ven. Nhu Lien (Susanta). We are looking for funds to meet the printing cost of some of these books. I appeal to all Dhamma friends to join hands in this program to make our world a compassionate and a better place to live. It is an honour for you to be invited by Ajahn Sujato of Santi Forest Monastery, Sydney to help with his Bhikkhuni training programme for two years. Would it affect your mission in Vietnam? No, I don’t think so because Ajahn Sujato is very compassionate and allows me to spend half a year in Vietnam each year to continue my projects there. Right now, one of my brothers is helping to oversee the building of the temple. There is a large Vietnamese population in Sydney and other cities. I hope to be able to reach out to them and spread the Buddha Sasana to them. You also had a discussion with Ven Aggacitta in Sasanarakkha Buddhist Sanctuary in Taiping, Malaysia in January this year on the possibility of a Bhikkhuni training centre in Malaysia. What are your feelings on this? I rejoice at this development. I hope this can materialize soon so that women, not only from Malaysia but from neighbouring countries can have the opportunity to train under good masters in a conducive and supportive environment. You won international awards from the BBC in 1994 for your work ‘Writing Very Short Stories’ and the ‘Outstanding Woman in Buddhism’ from the United Nations in 2007. How did that come about? The first one was submitted by my sister while the second one was submitted by a Thai bhikkhuni. I always enjoyed writing short stories and novels and even enrolled in a writing course. All my works were very sad though and made my readers cry! As a final question, what advice would you give for those who want to go forth? For those who wish to go forth, I think they are more fortunate and are more advantages than when I renounced 16 years ago! I did try very hard to keep the nun life pure and energetic with motivation leading upward on the spiritual path. My advice is to do the same. Let us re-hear the Buddha’s compassionate appeal: “Go and work for the good of the many, for the benefit of the many, for the well-being and happiness of gods and men!” Let us put Metta and Karuna into action!